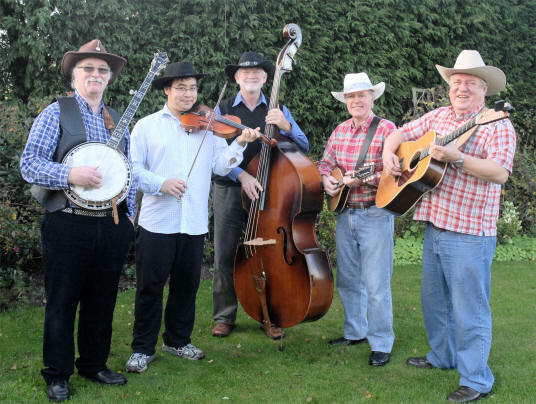 Whilst the Biggin Hillbillies mainstream is bluegrass music, their varied repertoire of acoustic music includes country and folk numbers, 50’s and 60’s pop, Irish favourites and jazz standards. As well as bluegrass standards from Flatt & Scruggs, The Stanley Brothers & Bill Munroe they also include numbers from the likes of The Country Gentlemen, Banjo Dan Lindner and Don Reno, plus of course the ever requested ‘Duelling Banjos’ and ‘Foggy Mountain Breakdown’ featuring Bobs’ unmistakeable bluegrass banjo style. Their Country and Western music list draws on the hits of Hank Williams, Johnny Cash, John Denver, Jimmie Rodgers, Don Williams as well as lesser known items from the likes of Buck Owens and The Red Clay Ramblers. Irish music favourites such as ‘Whiskey in the Jar’, ‘Muirsheen Durkin’ and ‘The Masons Apron’ form cornerstones of their repertoire. They also include a few jazz standards like ‘Sweet Georgia Brown’, ‘Sweet Sue’ and ‘Bye Bye Blues’ in the list, often inspired by Bob’s in depth knowledge of old time favourites going back to his days of tuition from a ‘Black & White Minstrels’ banjo artist. Of course no gig would be complete without some vintage rock and pop numbers from Buddy Holly, The Beatles and other 50’s/60’s stars. The boys have recently added two original numbers to their repertoire, Billys Night Out (note this has been downsampled to allow quicker download) and ‘On This and Every Day’ penned by Bob and John respectively. Bob’s number is included on the band’s first CD which can be reviewed by clicking the above link. The band is available for gigs throughout the South East and have performed at concerts, pub gigs, club events, private parties, barn dances, weddings, barbecues and outdoor fetes. They are very flexible and take a pride in making each gig a success.